On Sunday, April 8, 2018, 4-H youth in Sitka began building a dory! Meetings will take place on Sundays, 12:30 - 3:00 p.m., until the boat is finished (estimated to be approx. the end of May). Boat building adult leaders are Paul Rioux, Tom Crane, Terry Perensovich, and Joe D'Arenzio. We are also planning a paddle making workshop with Mark Sixeby at the Sitka National Historical Park in May. We have a crew of 12 youth ages 7 and up who are signed up for the project and other youth will be invited to help as space is available. This project is a partnership with Sitka Marine Heritage Society and all sessions will take place at the Historical Boathouse. A boat hasn't been built in the boathouse for 30+ years so this is a highly anticipated project on many levels! What's Happening IN SITKA 4-H? 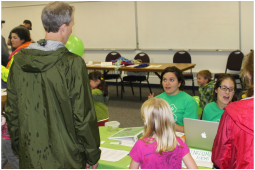 Sitka 4-H offers year-round youth opportunities.